It is desirable to place the node as close as possible to the heavy current consumers, which unfortunately puts the node in a crash-vulnerable location. The consequences of damage to a node can be ameliorated by splitting the functions to the left and the right lamp clusters, with a slave node for each side and one at the centre to minimise the number of heavy wires. This is the basic set of lights at the front of the car. 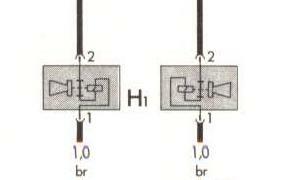 L1 and L2 are the main headlights with low and high-beam filaments, left and right, respectively. L13 and L14 are the driving lights. M1 and M3 are parking lights. Not shown are M5 and M7, the left and right front indicator lamps; left and right fog lamps and side repeaters for indicators. The biggest load to be controlled by the node is the starter solenoid of the starter motor B. It still takes a hefty current to operate at terminal 50 so a well-protected, 60A high-side FET drive is required. 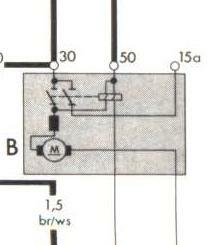 Notably, the current flow diagram shows a parallel terminal 15a inside the solenoid (originally intended for bypassing an ignition coil’s ballast resistor in some cars), which will present battery voltage when the solenoid is engaged. That’s useful feedback. The node can also measure battery voltage during cranking, giving an indication of cranking speed and battery condition. By monitoring engine speed via ignition pulses, the node can in the first place determine if the starter should be engaged when commanded, and it can release the starter solenoid as soon as the engine is turning over at sufficient speed; quicker than what it could be turned by the starter. If the starter activated but there are no ignition pulses, then the starter stops trying to start the engine; unless the start command (50) keeps being asserted by the starter key. The controller can also count the number of engine revolutions before the engine “fired”, a count which the bus master can retrieve and store to get a history. The same count can also be used to limit the number of revolutions that the engine is turned by the starter. The twist of the ignition key to start would equate to a push-button to initiate the start process. Switching off the ignition would cancel the engine-start request before the engine fires. Other devices on the left side of the car relate to thermal management and are owned by a node dedicated to that task. Lamps all need to be driven at full battery voltage for maximum life and illumination. High-side MOSFET switches are efficient, are (usually) short-circuit protected and can (not all do) provide the ability to monitor the load so a blown filament can be discovered quickly. 1mm2 wiring is sufficient to each of the high and low beam, driving and fog lamps; and the horns. 0.5mm2 wirirng will do for each of the indicator and parking lamps. 4mm2 wiring should go out to the starter solenoid and into the node as well. However, as the headlights are “unloaded” during starting, the chassis return need not take into account the starter solenoid with 4mm2 being ample for the front-left node. 2.5mm2 is sufficient for the last part of the power supply cable running to the front-right node as is the same size wire for chassis common near the headlight mounting point. The presence of several high-current devices in the centre of the car justifies a centre node to handle the wiper motor, proxy power, proxy signals and sensing of ECU signals. Wiper motor control is not simply PWM because of the need to park the wipers accurately out of the eye-line of the driver while overcoming the motor’s inertia. Terminal 53 is the low-speed wiper motor connection. An internal switch (typically operated by a cam on the motor shaft) alternates between continuing 12V supply to keep the motor turning after the wipers are commanded to park, and shorting the windings to terminal 31 (chassis) when the motor reaches the parked position. It works the same way that it has for about 40 years. To drive the wiper motor using PWM at terminal 53b (high-speed), the slave node has to monitor terminal 53e to detect the parked position; and if the wipers have been commanded to park, to immediately stop supply at 53b and to short terminal 53 to 31 using a high-capacity shunting FET. The shunting FET need only be active for a short time. As the position sense is always available to the slave node, the controller can determine wiper speed by the interval between pulses and predictively slow the motor to the parked position when the motor is commanded to park, minimising the amount of dynamic braking to be delivered by the shunting FET. Software can detect a speed change in wiping at a constant PWM duty cycle. This information could notionally be used to adapt the wipe rate to variable precipitation which tends to lubricate the screen’s surface. A sharp increase in friction means e.g. the end of a rain shower but a slow increase over time likely indicates wiper blade wear. A totally new way to handle windscreen wipers is described on the Features page. Note that each high-current output may provide a useful, digital feedback signal so the node should have the I/O ports available to deal with that. As well as other signals to and from the ECU which may be handy for e.g. trouble-shooting. Available signals are documented at the A2 Resource. The car of concern employs CE2. The ECU runs most outputs by pulling them down to chassis ground (terminal 13) which connects back to the battery common using a single 1.5mm2 wire. The only exception is the lambda heater whose common is tied to the engine block. Similarly, the ignition amplifier has a single 1.5mm2 wire to the battery chassis common. The sinking of current by the devices “directly” to the battery leaves only a small 1mm2 chassis common wire requirement for the wiper motor and the node itself. On the plus side, the node must switch and supply a lot of current that should be met by using two 2.5mm2 wires in parallel. Anti-theft immobilization can be implemented in all relevant nodes. In the front body nodes, this can block the starter solenoid, shut off ignition power, and prevent power supply to the ECU. More subtly, nodes can lie about signals such as brake fluid level and oil pressure when an attempt to circumvent the immobilizer has been detected.